Friday night was another chance for Adrian and I to 'push some nice toys around'. Yep, another 4th Edition Warhammer 40K using the 'toys' we've both collected over the years. I took the Lost and the Damned again, and this time Adrian took his Tau (another of his m,any beautifully painted armies. I altered the L&tD army list this time, in an effort to make it just a little more competitive. I took the heavy weapons out of the traitor squads, and added an additional heavy weapons squad instead. The game was an objective based game, with 5 objectives (or 'Loot' counters). The winner was the player who controlled the most objectives (which means a scoring unit within 6" and NO enemy scoring unit within 6"). Both Adrian and I tend to take units that we think look good rather than looking to optimise combat capabilities etc. Adrian wanted to try his 'Gnarloch riders. For my part, while I use the 'Eye of Terror' codex for the L&tD, I don't stick strictly to the OOBs, so this army had 8 Troops choices - hardly a 'game breaker'. His army did however include two Hammerheads, while mine included a Valkyrie gunship and a Leman Russ. Set-up on the table, with the L&tD on the left, Tau on the right. I loaded my right wing, with a Chaos Dreadnought, two Traitor Sentinels armed with Lascannon, and a unit of Mutants. This left my left wing weak. One of the Sentinels, and the Chaos Dreadnought, with the Mutants behind. I managed to win the first turn, and the Sentinels armed with lascannon took out the Tau Hammerheads deployed against my right wing. The Fire Warriors didn't last, and the mutants consolidated into the Kroot who occupied the nearby woods which contained another objective marker. The right had certainly gone my way with the forces I'd deployed there. However it had been a different story on the traitor left, made worse by three units of traitors failing leadership tests, two of them when below 50% strength so unable to rally. The Tau right had eliminated most of the traitor left, secured two objectives, and pushed on. The Chaos Marines now advanced to finish off the Tau left and secure the objective that had been captured by the mutants. The Tau commander threw himself against the mutants, supported by the reserve Fire Warriors, in an effort to recover the lost objective. The remaining unit of traitors pushed forward to combat the Tau reserve moving across the centre. The table scene at the end of the 6th turn. Yep, that's a bottle of 'Crafty Beggars Pale Ale' in the background. A nice wee drop. The game finished with each side holding two objectives, with one disputed. It was a draw, a glorious draw. As always the game was great fun. The 4th edition rules continue to serve us well. We have agreed to one change. Neither of us like the old 'consolidation into contact' rule, which of course subsequently disappeared with GW's 5th edition. But we have agreed that what we perceive as specialist melee units should be allowed to do this. Units like mutants, Banshees, and Orks for example seem like likely choices. There are more, but you get the idea. 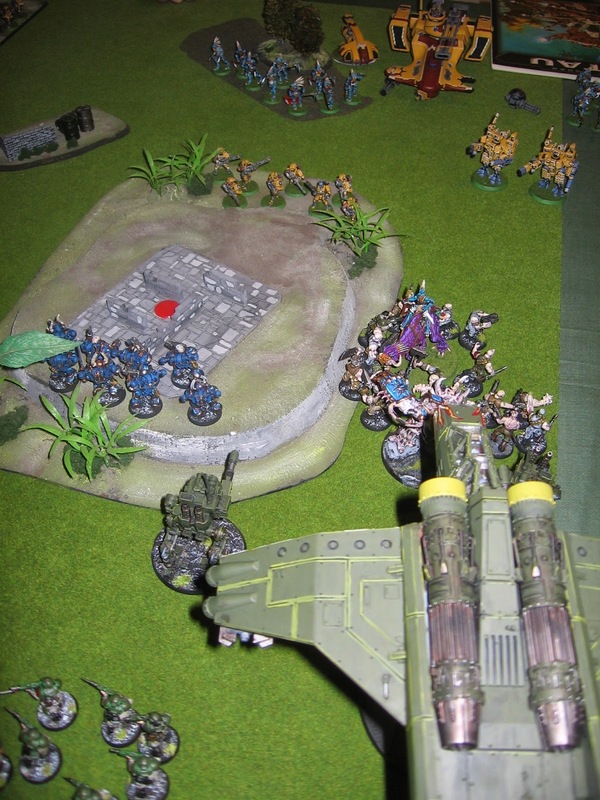 Very nice report and it's always nice to see 40K played with painted armies! There are 10 or so Fantasy / 40k / WarMachine players at my local gaming establishment and I don't know if there is more than one painted army among them. It's the visual thing that is the BIG appeal for us. Neither of us has a very high opinion of the rules system, but it works, and the point is that pushing these beautiful miniatures around on the table is a lovely spectacle. I couldn't imagine playing this game with unpainted miniatures. Ha! you're in for a shock when we play Kings of War in the next couple of weeks then!